The misericords of St George’s Chapel form one of the finest collections of 15th century carvings in the country. The carvers could choose what they wanted to depict, leading to scenes taken from bestiaries, literature and proverbs, and all aspects of human life. Depicted on the south side in stall 8 is a fox in priest’s garb, preaching to a flock of geese [SGC PH CCA.248]. The fox represents cunning and falsehood, and the geese the gullible and foolish congregation. The sly fox would lull the geese into a false sense of security with his soothing words, enabling him to make them his dinner. The moral of this story was that foolish people are seduced by false doctrines. In the church, these representations were often used as warnings against the preaching of the Lollards, followers of a religious movement which began in the mid-14th century and continued to the Reformation. Continuing the story, the fox is suitably punished for his treachery. 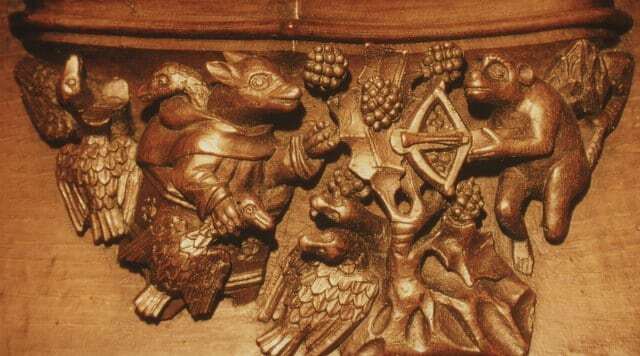 In the Windsor misericords this is depicted as three friars and a fox with a stolen goose being trundled in a wheelbarrow into the mouth of hell. The story of the preaching fox appears in the 12th century tales of Reynard the Fox, and gave rise to the proverb “When the fox preaches, look to your geese”. The stories of Reynard the Fox had become popular in English folklore by the 14th century and would have been well-known to the carvers. The stories featured in many contemporary works of literature, including Chaucer’s Canterbury Tales and in 1481, one of the earliest books printed by William Caxton was The Historie of Reynart the Foxe, a translation of a Dutch text. Many of the Reynard stories reflect in biting satire the peasant’s criticism and contempt for the upper classes and the clergy so, despite its use by the Roman Catholic Church as a propaganda weapon against reformers, this image could equally be seen as a message to the established church, that congregations were not prepared to put up with those corrupt members of the clergy who promoted their own concerns above the good of the people.